Over the course of three games, adventurer Nathan Drake, the star of developer Naughty Dog’s Uncharted series, has climbed a lot of cliff faces and shimmied down a lot of drain pipes, all in the name of finding ancient treasure, most of it done with a witty quip or a punch or three. 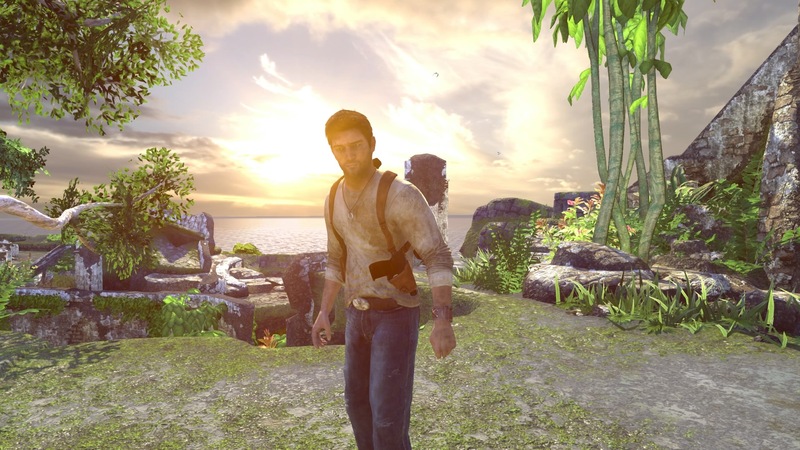 Drake is undoubtbly one of Sony’s leading men and has been given the re-master treatment by Bluepoint Games in Uncharted The Nathan Drake Collection, and the company has done a great job breathing new life into a series that debuted on the PlayStation 3. Among the improvements are all three games are now targeting 1080p/60 frames a second, improved environment lighting, character models and shaders, and increased texture detail. There’s also now a speed run mode, if you’re the type of player who likes to run-n-gun it in the fasted time possible. BluePoint has also added a photo mode, which is common for PS4 games these days, and reduced screen tearing. It’s a nice package.Oh, another nice touch is that the games keep a tally of how well you do in certain aspects (headshot, melee takedowns) and let you know how you’re doing against your online friends. 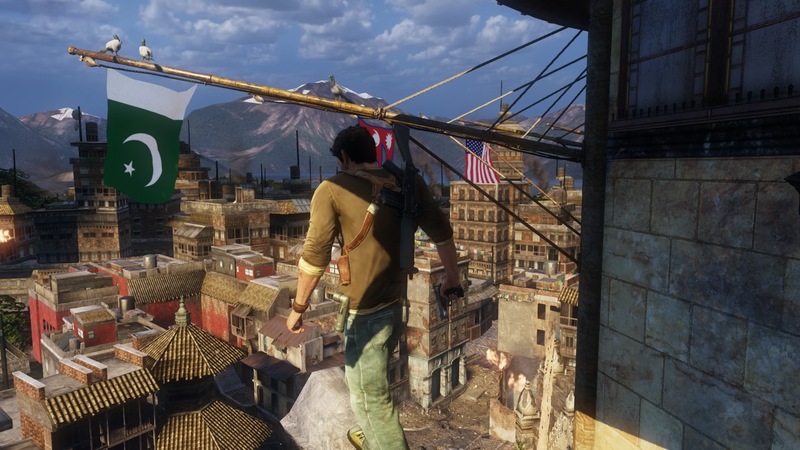 A shot from Nepal, in one of Uncharted 2’s most thrilling levels. Uncharted 2: Among Thieves was always my favourite game of the series, especially its Nepalese locations and its unforgettable opening moments, and if this remaster has done one thing, it’s shown me how badly the original Uncharted has fared since it’s release in 2007. Despite the remaster treatment, Drake’s Fortune hasn’t aged well, especially in terms of game play and when put up against Uncharted 2 and 3. Talking of game play, any niggles I have are nothing to do with BluePoint but with the Uncharted series in general. Enemies sometimes seem like bullet sponges, even when you think you’ve got them square in the noggin, and at times Nathan’s punches seem weak as a wet teabag. And whoever at Naughty Dog thought it was a good idea having chase levels where you had to guide Nathan towards the player (ie pulling down on the left analogue stick to make Drake run forward) to escape a chasing threat, needs to be slapped with a wet fish and told it was a bad, bad idea. 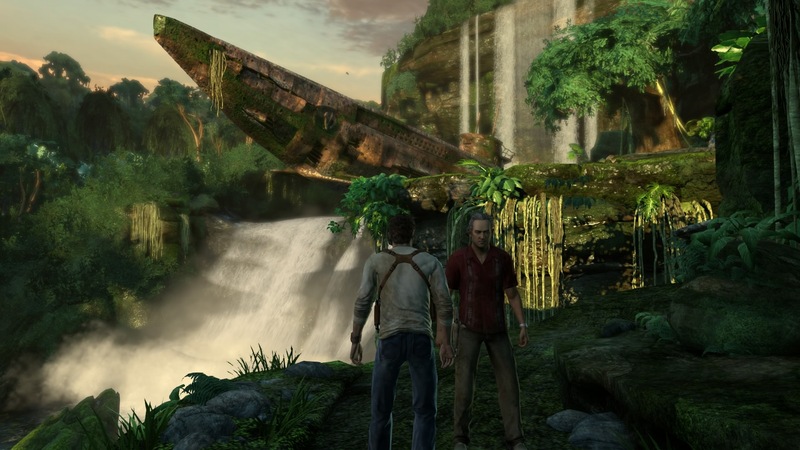 Nathan Drake and Sully discover the German U-boat from Drake’s Fortune. The three Uncharted games look great, especially Uncharted 2 and 3, with the environments now lush and vibrant (unless Drake and his pals are exploring underground catacombs or caverns so things are a little gloomier) but the The Nathan Drake Collection poses the same question that all re-masters of last-generations do: Is it worth your coin if you’ve played it before? A shot from Drake’s Fortune using the photo mode. Personally, I’ve enjoyed my time re-visiting the Uncharted series. They look fantastic and show how good the tech boffins at BluePoint games are but at times, the game play niggles frustrated me, especially with Drake’s Fortune. That said, Uncharted The Nathan Drake Collection is a lot of fun, despite the flaws and I’m looking forward to Uncharted 4 on the PS4. We have to remember that this is a re-master of an already established series, not a remake, so it’ll still have some of the niggles from the the original games. I really, really enjoyed playing an hour or two of each game at a time, just to see the progression between the two. If you you do decide to pick it up, I’m sure you won’t regret it. Here’s some capture of my playthrough of Uncharted: Drake’s Fortune captured using the PS4’s share functionality. Enjoy. All of the screen shots for this write-up were capturing using the collection’s Photo mode. Nice one Mr C. Great minds etc.